The ribbon repeats the brand identity while the Swarovski Gift Box Reindeer Antlers say Christmas. And while the Swarovski Gift will most certainly be special, the antlered presentation is even moreso. Make your Holiday gifting special in both regards with a visit to the store. 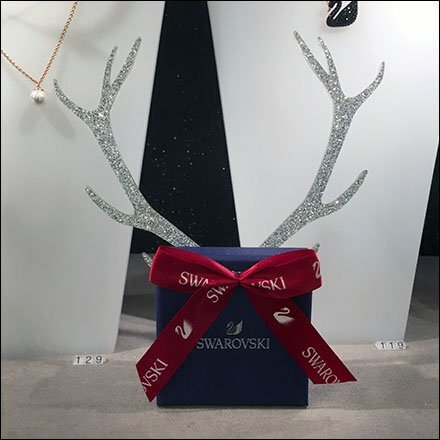 These Swarovski Gift Box Reindeer Antlers seen at the King of Prussia Mall, Philadelphia, Pennsylvania.